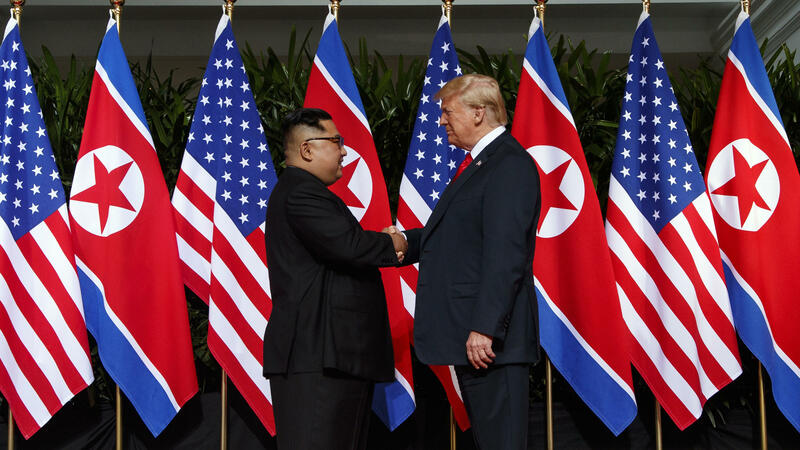 North Korean leader Kim Jong Un and President Trump shake hands prior to their meeting in Singapore in June 2018. President Trump and North Korean leader Kim Jong Un have agreed to a second meeting following their initial summit last year. "President Donald J. Trump met with Kim Yong Chol for an hour and half, to discuss denuclearization and a second summit, which will take place near the end of February. The President looks forward to meeting with Chairman Kim at a place to be announced at a later date," White House press secretary Sarah Sanders announced after Trump met Friday in the Oval Office with the North Korean envoy. Trump first met with Kim in June 2018 in Singapore, and the two appeared to form an unlikely bond after Trump had previously criticized Kim on Twitter, slamming him as "Little Rocket Man." But at the summit, Trump touted securing a commitment from Kim for North Korea to move toward denuclearization on the Korean Peninsula. However, reports since then have suggested the country has continued to develop nuclear weapons and missile technology. Sanders told reporters after the 90-minute meeting, which Secretary of State Mike Pompeo also attended, that sanctions would remain on North Korea until the White House sees the country achieve full denuclearization. However, she said the administration had seen "good steps and good faith moves" from North Korea, including releasing three American hostages just before the first summit. The prospect of a second summit has long been talked about. South Korean President Moon Jae-in returned from a meeting last fall with Kim saying the North Korean leader wanted to meet with Trump again. Kim reiterated his wish for another meeting with Trump during a New Year's address, however he also warned he might ramp up the country's nuclear weapons production if the U.S. does not end its economic sanctions against North Korea.